Since the late 1990s, the Indian community in Australia has grown faster than any other immigrant community. The Indian Diaspora has made substantial contributions to the multiethnic and multi-religious diversity within Australia. The growth of Hinduism and Sikhism through gurus, temples, yoga and rituals of many kind has brought new colours, images, customs and practices to the profile of Australian religion, and the Australian landscape more widely. At the same time, Hinduism and Sikhism have themselves been transformed as Hindus and Sikhs from different parts of India as well as Fiji, Malaysia and other parts of the world have come together to establish a pan-Indian ethos. Hindus and Sikhs here have also interacted with other sectors of the Australian population and with religions from the Western world. This is the theme of this book. The Indian Diaspora covers the theory of diaspora, the historical development of the Indian communities in Australia since the late 19th century to the present times, current practices and statistical profiles of Hindus and Sikhs in Australia, and interactions between Hindus and Sikhs with the wider Australian community. There are case-studies of the Indian students and women in the Australian community, of Indian communities in Melbourne and South Australia, and of temple building and the Sikh gurdwara. The book has been edited by and contains contributions from Purushottama Bilimoria, an internationally-known scholar of philosophy and religion, Jayant Bhalchandra Bapat, one of Australia's most senior Hindu priests and a scholar of Hinduism, and Philip Hughes, a leading analyst of the religious profiles of the Australian people. It also contains contributions from several other prominent scholars. Included are special essays on the importance of diaspora by the late Ninian Smart and on the 19th century Afghan cameleers and Indian hawkers. Purushottama Bilimoria, Ph.D., studied Philosophy, Sanskrit and Indian Religions in India, Australia and Oxford. He is Editor of Sophia, Journal in Philosophy and Religion, and International Journal of Dharma Studies. He teaches and researches in Australia, India and United States, and also publishes widely, on Indian ethics, Gandhi and global civil rights, Indian personal law and justice, diaspora studies and Indian dance in Australia. Jayant Bhalchandra Bapat is a Hindu community elder and a priest in Australia, and holds doctorate in Organic Chemistry and Sociology. Currently he is an Adjunct Research Fellow at Monash University Asia Institute, and has published widely in Hinduism studies. Dr Bapats research interests include Hindu goddesses, diaspora studies, temple priests and rituals. He has edited two books in this field of academic study. Rev. Dr Philip Hughes has been the senior research officer for the Christian Research Association in Australia since 1985. His research projects on Australia's religions and youth engage cross-cultural and multi-faith discourses. He is editor of Australia's Religious Communities: A Multimedia Exploration. Dr Hughes is a honorary research fellow at Edith Cowan University and the University of Divinity, as well as a minister with the Uniting Church in Australia. In Europe and the US, current debate about religions and religious communities of immigrants strongly focuses on Islam and Muslims. For some two decades, mainstream media as well as academic research have focused on this religion and its various sub-traditions. In particular, the terrorist Islamic attacks in the US in September 2001 and following attacks in Madrid (2004) and London (2005) channelled journalists' attention and social awareness towards Islam and Muslims. In contrast, Hindus and Hindu communities, for example, seem almost non-existent in public discourse, as the Hindu chaplain at Princeton University told me in a conversation in the Fall of 2011; and likewise in respect of the Sikh community. The focus of discourse and public attention on Muslims and Islam has become almost an obsession. Other non-Christian religions, in contrast, seem to generate no public interest and remain unrecognised. Unfortunately, with a few exceptions, academic research and studies on immigrant religious communities strongly mirror this biased public picture. To some extent this focus appears understandable. These days, it is much easier to obtain a grant, financial support and public recognition for studying Muslims due to the perception of potential 'social menace' than for research into putatively 'exotic' and 'tolerant' Hindu, Buddhist and Sikh immigrants and their communities in the North American, European and Australian diasporas. The current book edited and in large part written by Purushottama Bilimoria, Jayant Bhalchandra Bapat and Philip Hughes provides a welcome exception to the obsessive focus on Islam and Muslims in Western migration research. It highlights that Hindus and Sikhs in Australia have experienced over a century-long diaspora. It emphasises that religious belonging and religious identity have proven to be vital to the immigrants as they construct their new homes-away-from-home in Australia. 'The religious world-view', as Bilimoria stresses in the first chapter, 'brings with it a cultural imaginary of difference (however vague its self- articulation) and reinforces a sense of worth of the otherwise marooned or alienated individual that one becomes in this transnational migration process' (p. 15). The process, paradoxically, also strongly helps to generate and retain a sense of self-esteem and dignity, and it finds material expression for these in the construction of their magnificent Hindu temples and Sikh gurdwaras. In addition, socially 'the mandir and gurdwara make the Hindu and Sikh identity publicly visible' (p. 16) and thus a noticeable part of current multi-faith Australia. Certainly this volume is not the first of its kind on Indian people in Australia, but it is the most encompassing, detailed and timely. Earlier accounts by the same authors date back some 15-20 years. 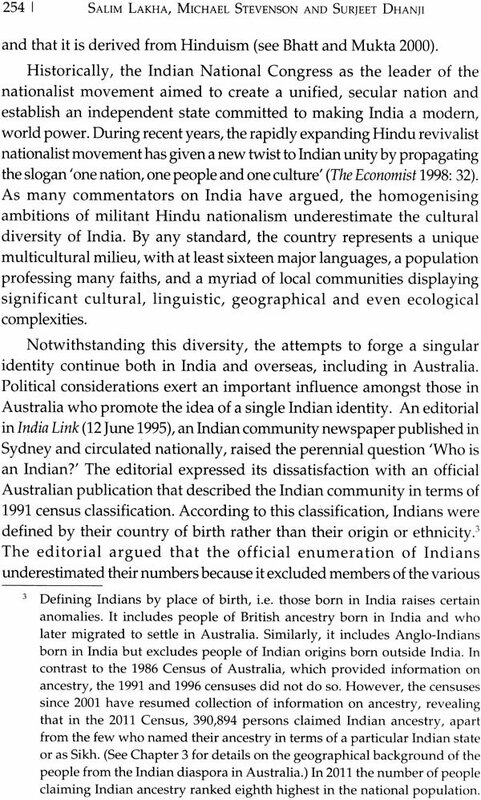 Following the pioneer study by Marie de Lepervanche on Indians in White Australia (Allen & Unwin, 1984), Purushottama Bilimoria published his book on Hinduism in Australia: Mandala for the Gods (Spectrum Publications with Deakin University Press, 1989). 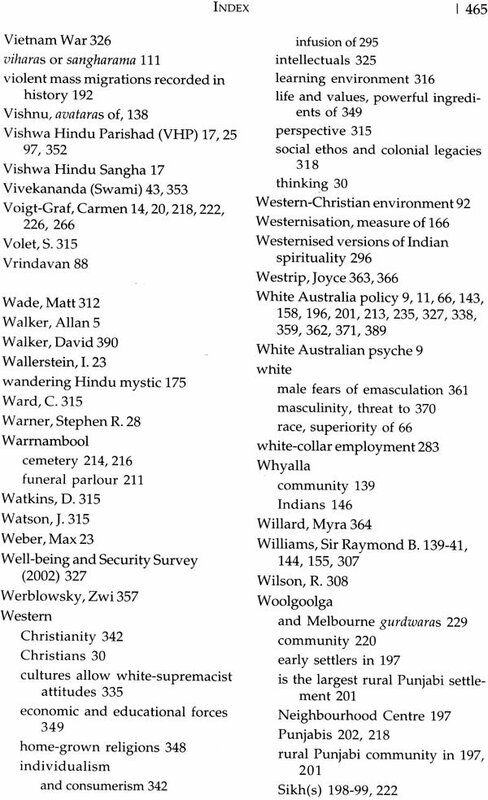 This was followed a few years later by the co- authored study with Philip Hughes, Hindus and Sikhs in Australia (Bureau of Immigration, Multicultural, and Population Research, 1996) and the well- known multi-author volume edited by Gary Bouma, Many Religions, All Australian (Christian Research Association, 1996). Though these books provide solid and insightful accounts with much information, data and discerning analyses, there is an urgent need for a fresh and timely publication. In the quarter century since the first major studies on Indian people in Australia were published, the Indian diasporic presence in the sixth continent has increased tremendously: from some 40,000 settled Indian immigrants in 1981 to almost 300,000 Indian-born people in Australia in 2011 (see in detail Chapter 6). And the second and third generation is growing with more than 50,000 children of Sikh and Hindu families born in Australia according to the latest census (2011). Taking a longer perspective, it is apparent that Hinduism and Sikhism in Australia, despite much smaller numbers (around 4,500 Indians in 1900), have seen major developments, particularly as Australia moved from its early restrictive 'White Australia' policy to a more open, multicultural and multi-faith nation state with new policies of immigration since the 1970s. It is, then, indeed propitiously timely for a major up-date to the earlier books that will certainly further our understanding of Hindus and Sikhs, and their religious practices, ideas and traditions in Australia. In fact, informed descriptions and explanations of the religious traditions form an important part of the volume. We use 'diaspora' provisionally to indicate our belief that the term that once described Jewish, Greek, and Armenian dispersion now shares meanings with a larger semantic domain that includes words like immigrant, expatriate, refugee, guestworker, exile community, overseas community, ethnic community. As scholars in African studies, political science, anthropology and linguistics increasingly made use of the newly-discovered term, the study of religions was a latecomer. 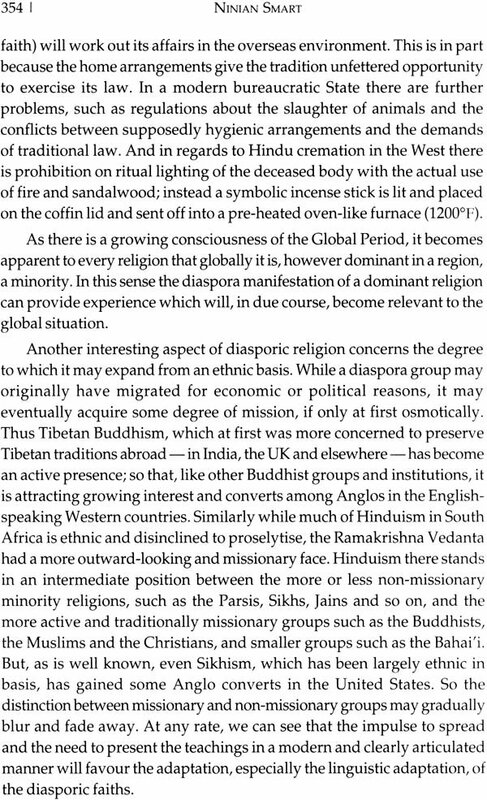 The first to highlight the 'Importance of Diaspora' was the late historian of religions Ninian Smart with his seminal, though somewhat hidden, published article in 1987. Rightfully, the editors of this volume express their debt to Smart and his early insights by reprinting the paper in the Appendix A. A decade later, British scholar John Hinnells compellingly took up the notion of diaspora, systematising ten factors in a diaspora religion's change and continuity, and differentiating seven areas of research (Hinnells 1997). Chapter 5 of this volume likewise makes use of Hinnells's insights. It emphasises the strategies used by Hindu communities to both socially adapt and religious- culturally maintain themselves in the new surroundings. As an analytical concept, the term' diaspora' has the potential of being employed for transcultural, comparative purposes. Indeed, the academic discipline of the study of religions is based fundamentally on comparative insights and the establishing of meta-terms to capture similar structures, dynamics, and continuities. Studying the Hindus and Sikhs in Australian society is thus not only of value for the people of Australia and various scholars interested in the cultural history of that continent; rather, as numerous chapters in the volume highlight, studying the processes of the Indian people settling in this formerly racially exclusivist White society brings to the fore typical processes and changes similarly observable among other immigrant people, be it in the Americas or Europe. Amongst other features, the immigrants' feeling of loss and dislocation from their former homeland gradually gives way to a cultural and religious reorganisation of their lives in the new country. 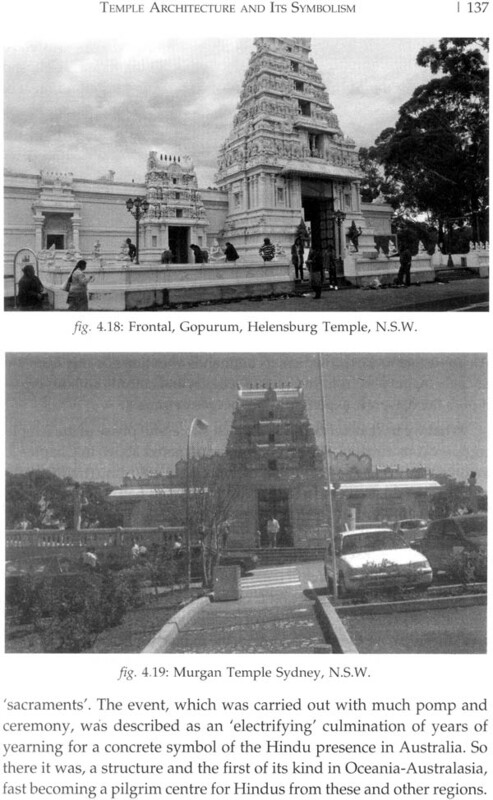 Provisional places of religious worship are founded and, with increasing visitors and financial opportunities, these are transformed to grand purpose-built constructions in typical Indian architectural style - as evidenced by the new Hindu temples (Chapter 4) and Sikh gurdwaras (Chapter 9) on the Australian soil. Also, at times these diasporic communal places of worship may acquire a heightened importance in relation to the country of origin. These places serve as both an emotional guarantee and psychological self-assurance for immigrants and their offspring, not forgetting the religious and cultural heritage, and keeping the memory of (former) origin alive. Moreover, these self-defined spaces of religious and cultural identity may serve as safe haven from where to embark to face the challenges in the new, at times discriminatory, environment. Rather than constituting places of distinction and withdrawal, the temples and gurdwaras often serve integrative functions for immigrants as they provide refuge, respectability and resources to ease and facilitate processes of social incorporation (Hirschman 2004). Furthermore, employing the term' diaspora' importantly emphasises the delineation of the triangular relationship of a diaspora group, country of present residence and (former) ancestral homeland. 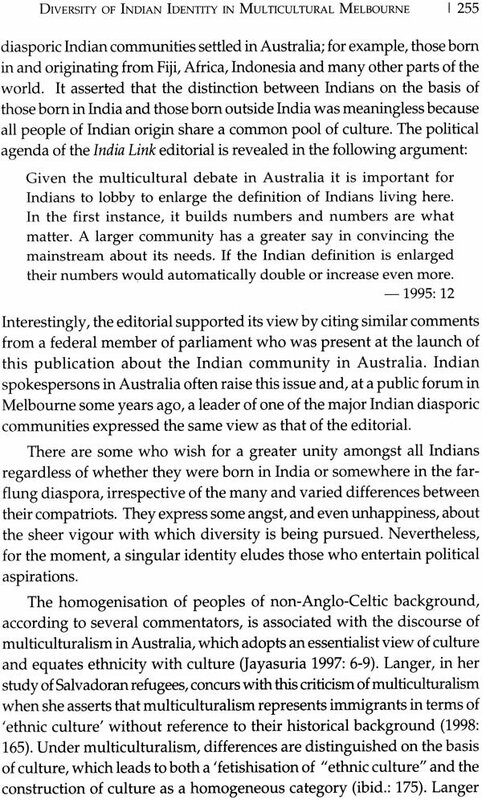 In this regard the authors of this volume, in underscoring the relationship between Indian immigrants and Australian society, have stated elsewhere in this volume that any diasporic experience produces major changes both in the receiving culture and the incoming culture of the diasporic group. A lot of accommodation is required on both sides. Australia has seen her fair share of racial and cultural intolerance since the white settlement 150 years ago and it needs to be avoided at all costs (pp. 334-37). The history of Hindu and Sikh diasporas in Australia provides ample evidence of this relation, too often fraught with suspicion and discrimination. However, as White dominance and sense of superiority gave way to a more tolerant and culturally mixed society, another important diasporic feature came to the fore. Typically, a diaspora group's retention of religious difference does not impede its socio-economic integration and a sense of national identification. So far, this insight appears to be confirmed primarily by data of Indian-born people in the educational and economic sectors of society (see Chapters 6 & 10). However, will the second and third generation offspring of the 1980s, 1990s and 2000s Indian immigrants also lean towards a strong identification with Australia, at the same time staying firm in their religious convictions and ritual practices? If so, this development will take on important bearings for political discourses about plural and multicultural societies in order to underscore the possibility of well- functioning, multi-faith, modem societies. In addition, venturing to take a look into the future, anticipated identity developments of a diaspora group from its incipient first immigrant generation to later second, third, fourth and following generations strongly raises the question of belonging vis-a-vis dislocation, and where exactly is the 'homeland'? Will the Indian sub-continent for the grandchildren and great-grandchildren in Australia still be the homeland or will Australia be the place of identification and feeling at home? Future processes will provide evidence of possible shifts of belonging. Existent comparative developments, however, argue for an increasingly strong identification with the land of residence and solely nostalgic remembrance of the former country of origin. In this regard, for instance, century-long established Japanese Shin Buddhists in the US (Tanaka 1997) and Indian Hindus in Trinidad (Baumann 2004) have shifted their identity towards the US and Trinidad respectively and away from Japan and India. Ironically, such shifts and dynamics make it increasingly problematic to speak of a diasporic group at all. American Japanese Buddhists and Trinidadian Hindus have become fully recognised citizens and have advanced on the socio-economic ladder. They no longer share the feelings of first generation immigrants of 'dislocation, disruption, distance from the "homeland" and the limits of hybridisation' (p. 4). However, it is too early to speculate about such forthcoming developments. The Hindu and Sikh diasporas in Australia, though dating back to the 19th century, exist no earlier in an uninterrupted generational line and are only present in sufficient numbers since the 1980s. Despite this brief length of time, the authors point to changes with regard to attitudes among this first generation of Hindus and Sikhs. 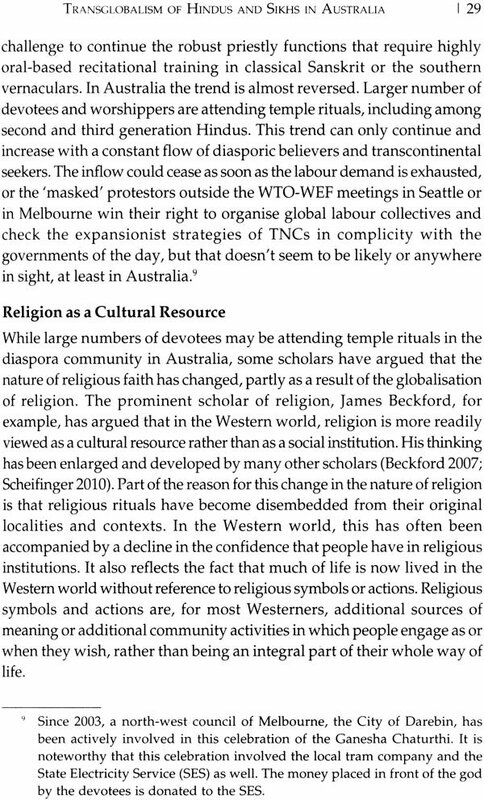 Signs of a 'Protestantisation' (p. 77) within the Hindu Australian community have become evident, stressing a more individualised faith and distancing themselves from ritual temple worship and the priest as intermediary (p. 229 & p. 339). 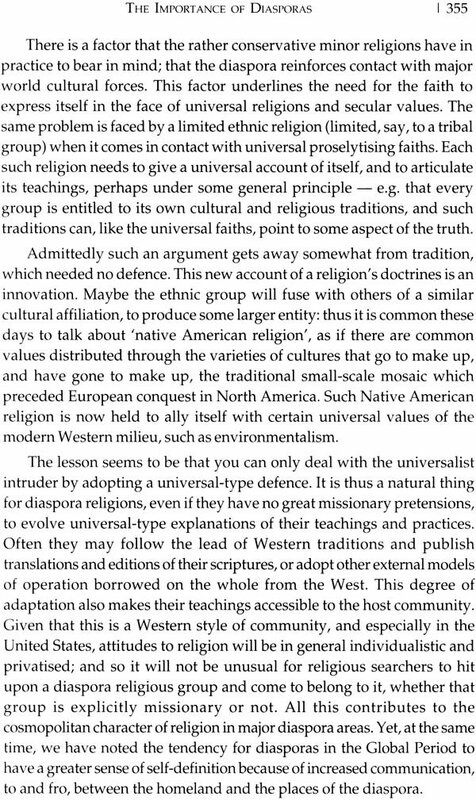 Will such trends possibly lead to tendencies of secularisation or to a newly-interpreted understanding of Hindu faith and practice, possibly stressing pan-Hindu ecumenical features in the subsequent generations, as author Heather Forster notes (p. 150)? 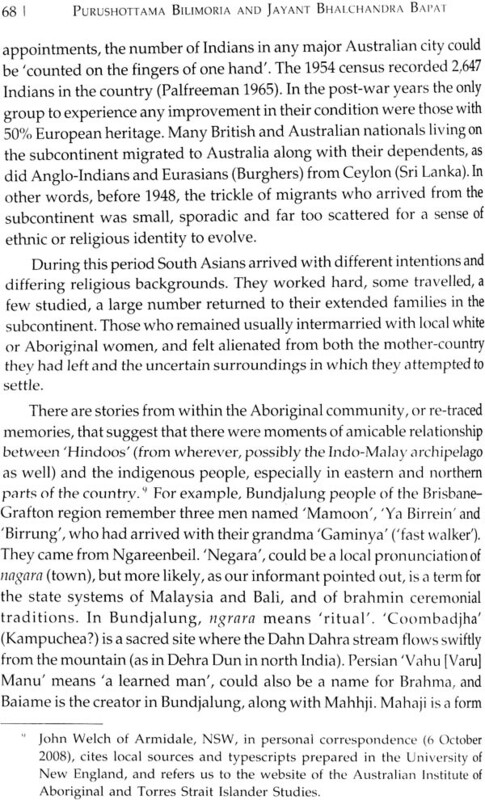 Or will the pattern of Sikhs in Woolgoogla, New South Wales, with their social distance from the Anglo-Australian majority and their strong sense of community be the preferred method to preserve culture and faith, warding off secularisation tendencies within the .second generation, as Carmen Voigt-Graf analyses (p. 228)? The rich collection of data, images and narratives provide ample opportunities to learn more about the Hindu and Sikh communities in contemporary Australia. It invites comparison of these insights and findings with other Hindu and Sikh communities and different religious diasporas in other nation states. Ever since the lifting of the 'White Australia' policy in the early 1970s- and even before that - immigration has been steadily transforming the profile of religious diversity in Australia, as it has in a number of Western nations. Up to the 1950s and 1960s, historical accounts of Australian religiosity focused primarily on variants of the religion brought over by the settlers and later missionaries, namely, Christianity, and occasionally on the apparently receding culture of the indigenous people. Not unlike in North America, today the new immigrants and their locally born descendants follow an array of the world's religions - Islam, Judaism, Buddhism, Hinduism, Sikhism, Shinto, Confucianism and Daoism. 2. Is Australia on the brink of a radical transformation, whereby new socio-theological categories wait to be framed in order to reflect the ensemble of diversely religious lifestyles, or spiritualities if you like? In what ways is the diversity of religions actually changing the nature of religion in the Australian context? Is it simply providing Australians with a 'supermarket' of religions, or are deeper and more profound changes occurring? Our present undertaking, however, which will contribute to these larger issues, is to consider the place, the tapas, of two minority 'new-comers among the immigrant religions in the backdrop of the dominant cultural framework. Where do the religions of the immigrant Hindus and Sikhs fit into and belong in the broader canvas of Australian life, in respect of both the secular and the religious contours of the nation? We may also ask in respect of the post-secular - i.e. the return or the infusion of the religious or spiritual back into the secular - which is the form of secularism followed in India, how are these religions being changed by the Australian context and how are they contributing to the changes in the Australian context? 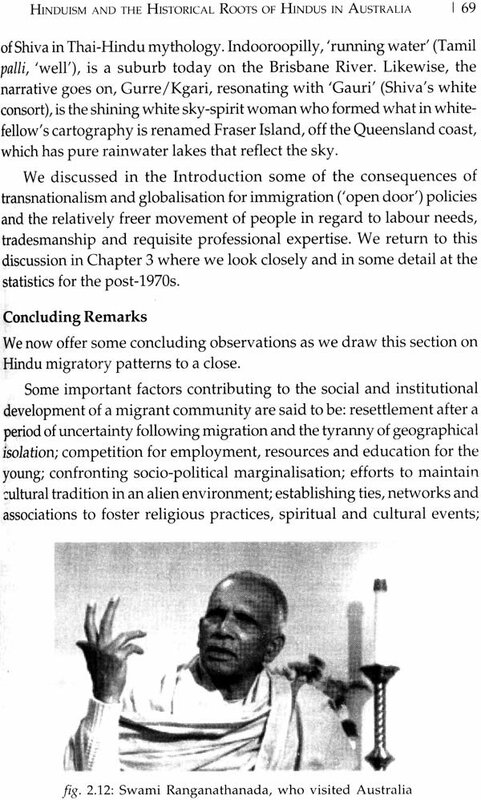 Our task, as we note above, cannot be accomplished without first documenting in as thorough a fashion as possible the whole history of the immigrants in the 'lucky country', from the early post-slavery indenture recruitment experiences, through the lean days of immigration restrictions, to the recent relatively large-scale influx of professionalised modem Hindus and their Sikh counterparts, as well as students of the same background from the subcontinent and elsewhere. This is a presence no Australian is likely to miss in almost any metropolitan and suburban region across the country, whether boarding a tram or bus, hailing a cab, looking for' Asian tucker', stopping for fuel at a petrol station, making a quick purchase at the comer 7-11 store, or arriving back home at an airport terminal. Unlike standard histories of immigrants and their demographic profile, ours is the history of religious beliefs, customs and practices as lived by the communities of immigrants in question. For that, we must provide the background to their traditions or spiritualities of the people, for otherwise the reader will be at a loss to contextualise the perceptions and experiences of the groups, nor be able to make much sense of the qualitative and quantitative analyses that follow in the later chapters of the study. The current work brings together experts and informants from the world of scholarship, as well from within the two traditional immigrant communities, in order to provide balance between the fault lines of 'insider' and 'outsider' perspectives. Having been trained in philosophy and social sciences we have been particularly sensitive to this methodological thrust. 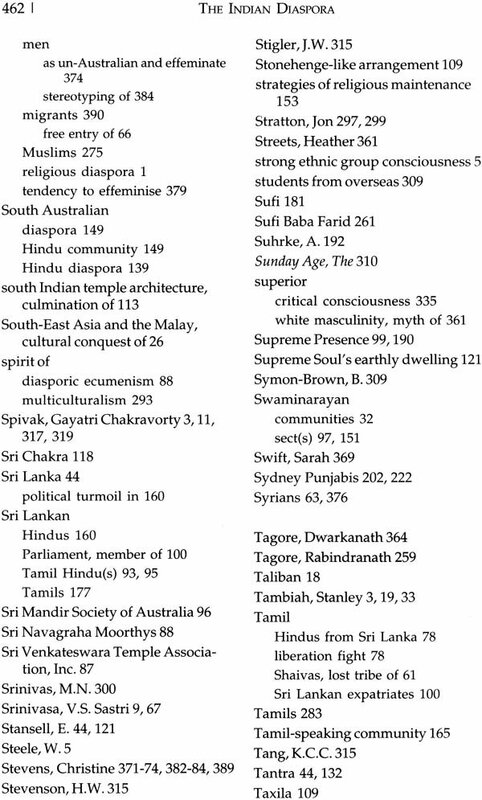 What is being offered in these pages, then, while not pretending to be a comprehensive account by any stretch of imagination, is what could be called 'the middle point account of the theology, history, socio- anthropology and demographic life-profile of Hindu and Sikh immigrant communities in Australia'. Our intention throughout in bringing together these essays, although academic in structure and scholarly in their discursive engagements, has been to make the text accessible to both lay readers and students in schools, who in many instances work on projects relating to Hindu and Sikh members of their community.' Australian historical and literary productions have turned a new page since the early phobias and alienations aroused by the tyranny of distances; ours is a small contribution to these developments, as well as to South Asian studies, inasmuch as the transnational diasporic (bharatiya pravasi) experience is an inexorable part of the identity of the 'new Indian' (in the making). The way the community is received determines, at least to some extent, the dialogue that develops between the receiving culture and the diaspora community. Part of this dialogue is taking place in the context of interfaith committees, councils, conferences and events, and the particular demands made by, and expectations of, the receiving culture. For example, there has been a demand within the Australian culture for Hindu 'chaplains' at hospitals. The interfaith context raises questions about how Hindu belief in the gods relate to the beliefs of other religions in their God or gods. The development of interfaith rituals is another part of this, both at a civic level, such as in times of crisis, like the Bali bombings, and at the personal level, in terms of interfaith marriages. The book comprises a set of closely-knitted essays written by different individuals. While they make for an overall thematic discussion as noted above (and in Chapter I), each essay also stands as a compact exposition and analysis from the standpoint of the author's own research into one aspect or another of the diasporic experience among Sikhs and Hindus, as well as Indians more generally. Hence, there is not the flow and movement towards a single argument as one would find in a single- authored work. The editors feel strongly, in bringing together these essays and Appendix items, that the readers stand to benefit from vignettes and gaining a deeper understanding of aspects of the two communities covered in this project. Indeed some readers may choose to selectively engage with themes and aspects that interest them most. Some may be in search of knowledge merely of the beliefs of the Hindus or Sikhs, for example, others their practices, and yet other readers may have an interest in the socio-demographic profile and interactive contribution of the communities to the host society (and the receptive response of the latter). As they say, there are horses for courses. A single author may not have been able to accomplish such a broad-ranging discursive task and provide a diversity of material, resources and analyses as will be found in a multi-authored anthology as this. The following provides a brief summary of each essay. Chapter 1 serves as the Introduction. It walks the reader through some of the theoretical discussions that have been taking place internationally in the areas of South Asian diaspora studies in the broader context of religious and post-colonial studies and transglobalism. 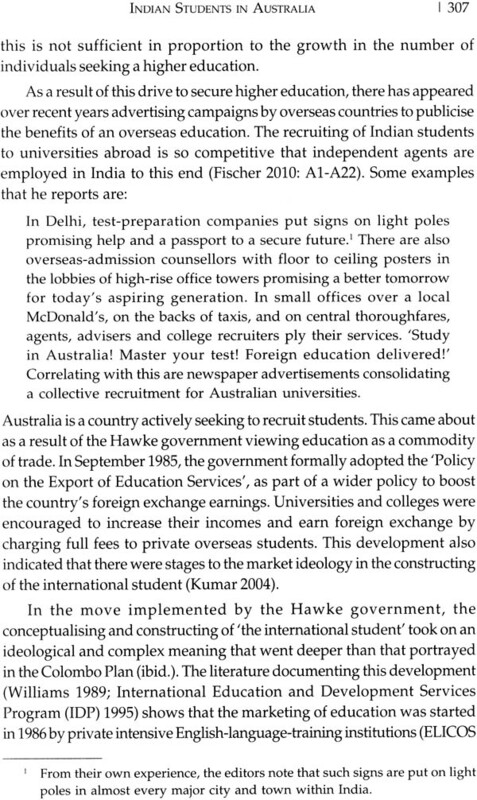 It engages with Arjun Appadurai's thesis of the tension and transition from the global to the local (glocal), and critiques it from the viewpoint of the Australian experience, while also demonstrating its applicability in areas such as that of the itinerant IT professionals who travel between Australia and Silicon Valley, California. The chapter also sets out the basic questions the book intends to raise and explore, and presents highlights from some of the later chapters (in respect of demographic profiles). Chapter 2 presents an outline of Hinduism (as in theory and practice), from early history to the present day. It then moves on to a discussion of local observances, such as auspicious days in the Hindu almanac and the rites that accompany their observance, how the major festivals are celebrated, and so on. This may seem somewhat prosaic in a I social sciences' type of study. However, our experience has been that many people - students, teachers and lay readers - have gone to the authors' previous books on Hinduism/Hindus and Sikhs in Australia to learn about Hinduism and Sikhism, because this information in a reliable form is rather sparse in the Oceanic context. Chapter 3 explains Hindu and Sikh religious practices in India and in Australia and comments on how these practices have changed in the country of adoption. This chapter examines the shifts and changes over the last 100 years since the arrival of Hindus and Sikhs with almost no place to worship at, to the emergence of a large number of temples and community organisations across the country. With the broader range of such migrants in the recent phase (farm-hand workers, merchants, IT- professional, students, family reunion, Sri Lankan Tamil refugees, Indo- Fiji Hindus, etc. ), the performative expressions and social involvements have also grown. 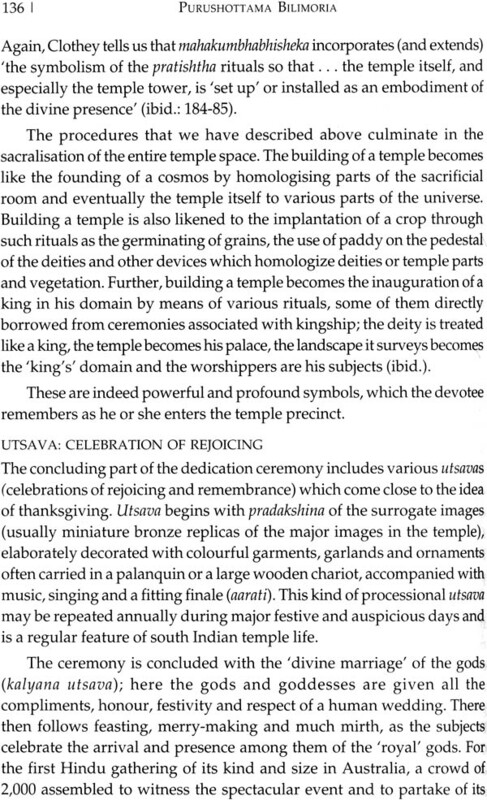 Chapter 4 discusses religious architecture and its symbolism - the Hindu mandir or temple. It examines the classical textual Agama and Vastu Shastra prescriptions for the location and structure of a typical Hindu temple as represented in south India, as well as the transplantation of this art and craft to the local Australian context, the rituals involved in consecration and instalment, and the 'awakening' of iconic deities. Chapter 5 is a case study of what gives sense to a Hindu community and its sustaining cultural pursuits. It looks at the strategies the migrant community has adopted to establish itself in its new surroundings. The chapter is situated in the framework of the study of diasporic Hindu communities undertaken by Raymond B. Williams, John Hinnells and Purushottama Bilimoria, and for its example draws on devotional practices and social engagement in the larger society of a group of followers of the late mega-guru, Sathya Sai Baba. 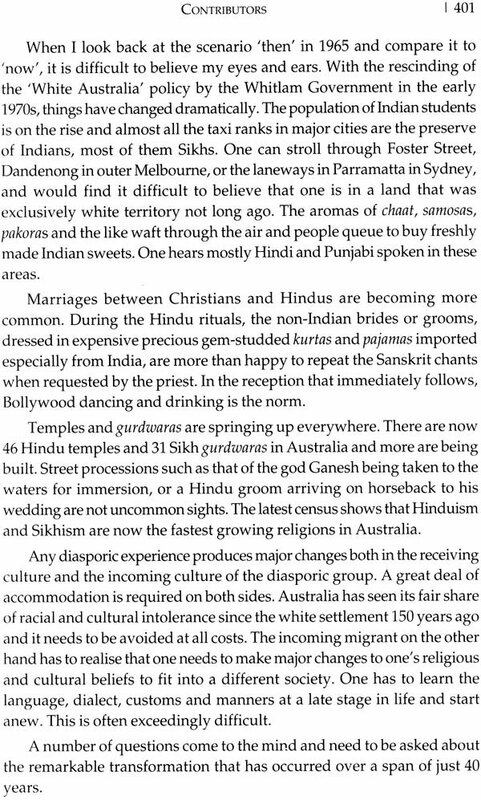 Chapter 6 presents a statistical overview of the Hindu community in Australia. It draws on the previous chapters and charts the changes in cultural and demographic profiles of Hindus to the present day, taking into account rolling census data from 1911 to the present day. 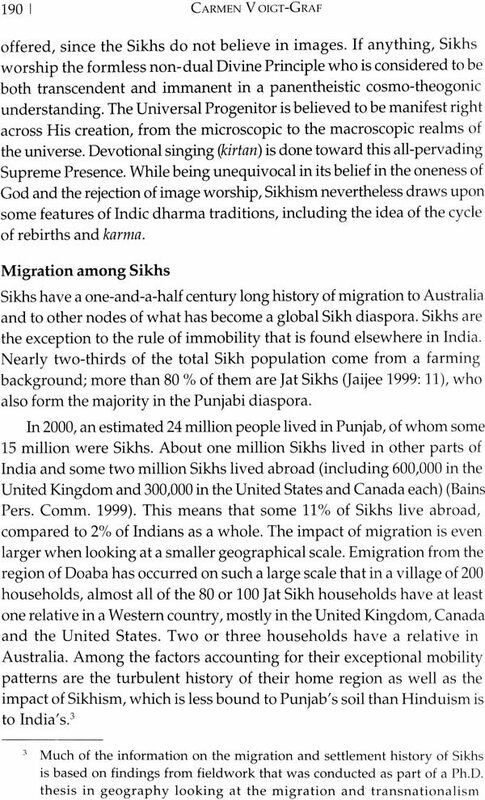 Chapter 7, in a similar way to the history and profile of Hindus in Australia, begins with a study of Sikh history and migration, and continues with a discussion of the beliefs and practices of the Sikhs. It is followed by a more detailed discussion of the migration of Sikhs to Australia and the development of the Sikh community in Australia. Chapter 8 presents a historical account of recent 'finds': the two graves of early Sikh hawkers in Victoria and how the interred remains of one were returned to his former homeland. Chapter 9 is an account of Sikh practices and life in rural Australia, followed by a section on the diverse Sikh communities in Australian cities, and the cultural and economic transnationalism of Australian Sikhs. There is also appended to this chapter an outline of the design of the Sikh temple or gurdwara, and the religious and social functions the gurdwara plays in the community, as well as in the national ethnospace. The discussion ends with a brief history of the earliest Sikh gurdwaras in Australia. Chapter 10 discusses Sikh immigration and social profile over the last century and charts the changes in cultural and demographic profiles of Sikhs, such as birthplace, age, geographic distribution, marital practices and related issues. The copious data and ensuing analyses draw on census statistics since 1911 to the current statistical releases from the Australian Bureau of Statistics. 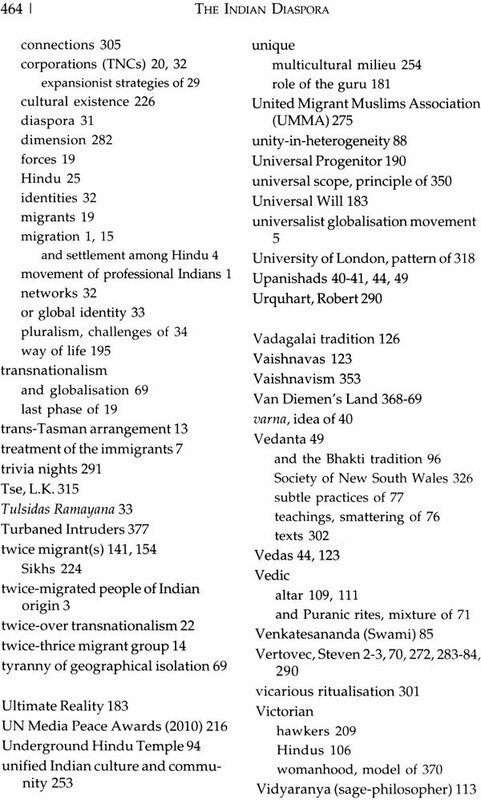 Chapter 11 begins with a set of general reflections on the Indian diaspora in Australia and brings together the two religious communities under a common identity (with some reference also to Muslims) under the rubric of 'Indian', and argues for a closer homogeneous nationalist sentiment between the two major Indian diasporic communities than exists on the subcontinent. The chapter also goes beyond religious practices to other cultural involvements and preoccupations, mostly to do with food (cuisine and restaurants), language, public life and so on. Chapter 12 considers how the process of migration generates a sense of alienation and/or dislocation, and how this 'anomie' impacts on Indian women in their diasporic daily lives. Drawing on survey data and narrative evidence, the writer argues that this response is based on two sets of factors. The first is their religious nurturing in India and the second is the level of displacement experienced in Australia, the host country. Analysis, based on patterns of religious behaviours such as rituals, temple attendance, and customs involving prayer, food and dress, indicates that Indian women draw on their pre-migration experiences to evolve coping strategies for everyday living that are both traditional and contemporary. Chapter 13 explores the experiences of Indian students (basically Hindus and Sikhs) who account for a sudden increase in the South Asian migrant presence in Australia. There have been some awkward episodes and even violent attacks on Indian students by members of the host society, which this chapter attempts to contextualise, as well as discussing other ramifications of the 'Indian student phenomenon'. Chapter 14 notes how the attitudes of Australians of European heritage have changed towards people of various religions since the 19th century. Using survey data gathered in 2009, it describes attitudes towards Hindus in the Australian culture and suggests various factors significant in those attitudes. Chapter 15 summarises the preceding chapters and explores implications of the South Asian transnational presence and involvement in Australia. 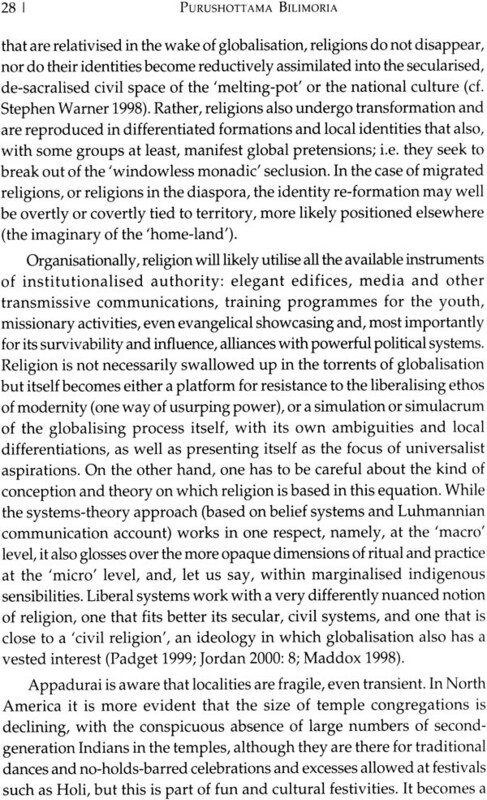 The chapter discusses possible trajectories for future developments of Australian multicultural hybridity and pluralist religious society (given the declining regenerative statistics of Anglo-Celtic-European population). This is explored in the context of the Asia-Pacific rim extending to the shores of California; the Australian nation's own ambivalent relations with its former sovereign, Great Britain; and until recently its larger trading partners in the first-world powers, the United States and Japan (now increasingly replaced by China and India). We are fortunate to have been able to include in the Appendix a chapter on 'diaspora' by the late Ninian Smart, who was a pioneer in the field of secular religious studies and who was responsible for raising its status as an academic discipline. Although written in the early 1990s, his observations are every bit as relevant today, as interest in diasporic religious communities grows. An additional Appendix, written by Richard Forster, describes one of the earliest groups of Indians to come to Australia: the cameleers who worked across the untamed outback in the 19th century.